Our blog for September, 'Angus and Dundee: A Personal View', is written by Olwyn Jack at 4 Star Gold Duntrune House B&B which overlooks the city of Dundee. 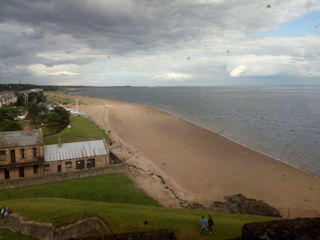 Broughty Ferry is where my family has lived for over four hundred years. I have seen many changes over my lifetime, but have never ceased to appreciate how lucky I am to live in the hidden county of Angus with its variety of coastal and countryside scenery. We love to take our visitors on a trip by car up the Dundee Law where they see a breathtaking view over the Estuary of the River Tay to the Lomond Hills of Fife, the fertile Carse of Gowrie, and the Sidlaw Hills just hiding the glens of Angus - Clova, Isla and Prosen - good walking countryside. 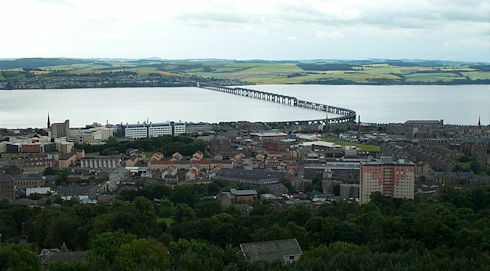 From here, you can also see the road and rail bridges spanning the Tay, Frigate Unicorn and RRS Discovery part of Dundee's maritime past. 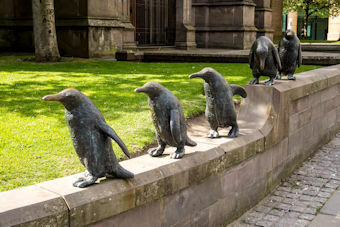 In 2005 after a commission by Dundee City Council, 5 penguins were created by sculptor Angela Hunter to commemorate the RRS Discovery, the famous ship used for Captain Robert Falcon Scott's first successful journey to the Antarctic. They now sit on the wall of the City Churches in central Dundee. 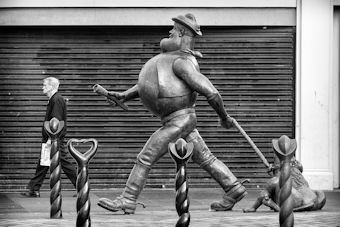 They are one of a number of pieces of public art throughout the city, including Desperate Dan and a dragon. For ten weeks in summer 2018, the streets, parks and public areas of Dundee and its surrounding landscape were invaded by a colony of colourful giant penguins as part of a Wild in Art event by Maggie's Dundee. We must not forget another part of Dundee's history. Once known as Jutopolis due to the thriving industry of weaving jute for sacks, the city's mills are now providing housing in flats. The former mill at Verdant Works is now a museum telling the story of the process of turning jute into cloth and the conditions of those who worked in the mills. Some of those workers tell their stories. Dundee's beloved McManus Art Gallery and Museum containing the skeleton of the famous Tay whale has undergone a major revamp and its layout makes it easy to pop in to explore one of its many themed rooms with lots of things for children to do. 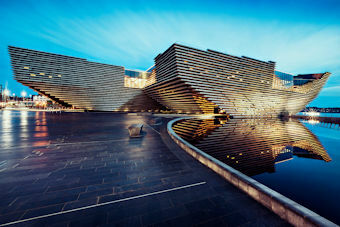 September 15th 2018 sees the opening of V&A Dundee, Scotland's first design museum. It will host major exhibitions, celebrate design heritage, inspire and promote contemporary talent, and encourage future design innovation. The building itself is an iconic feature, sitting like a ship launching into the sea. The Japanese architect, Kengo Kuma, is designing the stadium for Tokyo Olympic games in 2020. Looking out to the North Sea, you can see the old fishing village of Broughty Ferry with its castle on a promontory, a large stretch of golden sands and now a bustling scene of boutique shops and mouth watering cafes - our grandsons' favourite being the ice cream parlour - Visocchi's. 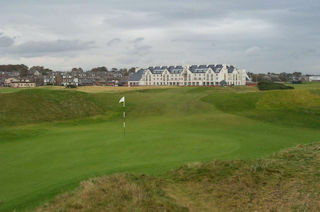 The challenging links of Carnoustie Golf Course, scene of the British Open, is a favourite with our golfing friends. A little further on is Arbroath, home of that delicacy the "Smokie", a fish to challenge the most sophisticated of foods especially when eaten straight from one of the many smokeries. We often serve this for breakfast. 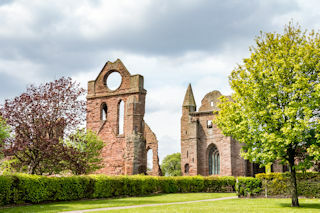 We sometimes pop in to Arbroath Abbey to witness the colourful re-enactment of the Declaration of Arbroath 1320, securing Scotland's independence from England. 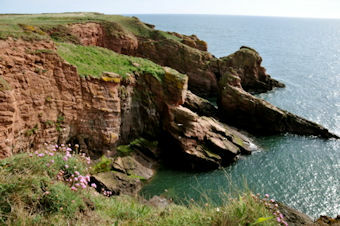 We enjoy a walk along Seaton Cliffs a paradise for flora and fauna of coastal Angus. 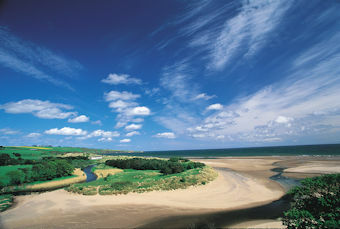 A few miles northwards is one of our favourite places, Lunan Bay. The thrill of the smell, sight and sounds of the North Sea breaking on the stunning beach is etched in our psyche. The Royal Burgh of Montrose is the most northerly coastal town of Angus. We like its wide-open streets and the narrow alleys leading off down to the sea. It is located at the mouth of a spectacular tidal lagoon, which is now an important wildlife sanctuary. Nearby is House of Dun, once the home of the Angus poet Violet Jacob. It has spectacular plasterwork, a lovely garden - not to mention great home baking in the café and working craft shops. 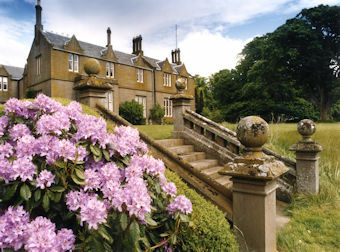 Inland, at the entrance to Glen Esk, lies Edzell Castle. It has one of the most unusual walled gardens we have ever seen - carved figures and niches for plants as well as a knot garden. Further into the glen is The Retreat Glenesk, a good place to sample Scottish home baking and Scottish crafts. Another favourite place is the little red toon of Kirriemuir, the Gateway to the Glens. It is worth visiting the Camera Obscura on Kirrie Hill, donated to his birthplace by Sir JM Barrie the author of Peter Pan. 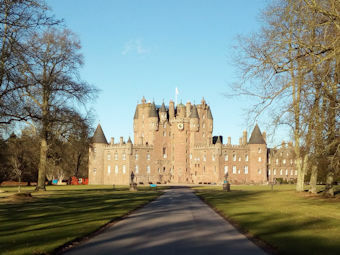 This is just 5 miles from fairy tale Glamis Castle. Angus, known as Scotland's birthplace, is last refuge of the ancient blue painted Picts. 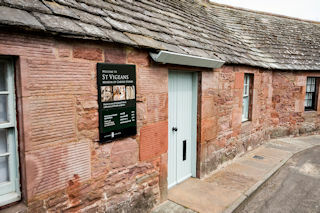 St Vigeans Museum, near Arbroath, carved standing stones at Aberlemno and Meigle Museum holding many artefacts, tell the story of their culture.